Subjects: Two standard and one 1arge stand pie, purchased warm. One standard eaten in the field, others returned to base for detailed assessment/examination. 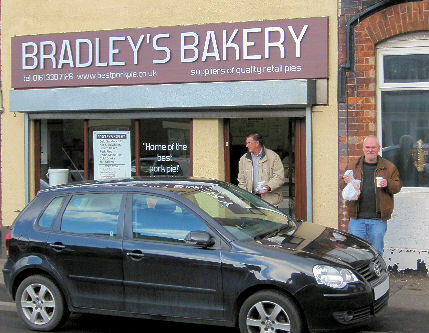 External appearance: Pale and slightly bulbous, not well glazed, hole for gravy. 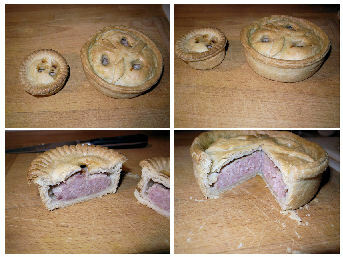 Cross-section: Meat pink and well-textured – granular and friable, gravy not full to hole but some present in pie. Pastry for lid and sides thick and was quite crumbly – evidence of pastry trimming re-use: multilayering in lid. Taste: Meat up there with the best peppery, good porky taste and nice texture. Gravy only added for moistness sake no flavour at all (sampled separately in polystyrene cup for top up purposes). Probably meat taste is the reason for local claims to greatness, plus lack of competition this side of the Yorkshire border. Pastry while quite tasty, was ultimately disappointing: too thick, very hard in parts, undercooked and doughy others consistency was not good needed more fat content, tended towards short crust crumble rather than hot water ‘snap’. Summary: a good tasting pie but plenty of room for improvement particularly in the pastry more fat here please and thinner. The lack of flavour in the gravy was also a missed opportunity.